• Provide non-biased emotional, physical and informational support during pregnancy, labor and the birth process, and the immediate postpartum period. • Work closely with the birthing woman and her family as she explores her values and needs surrounding birth. • Encourage the birthing woman and her partner to seek care and a place of birth that reflects their values and needs. • Assist in the preparation of birth preferences to facilitate communication with the birth team. • Provide the birthing woman with non-medical comfort techniques and alternatives for labor (including but not limited to positions and movement, comforting touch, visualization, breathing techniques, essential oils, rebozo and affirmation). • Provide support and assistance with initial breastfeeding. • Assist the mother in processing her birth experience. • Answer general questions about newborn care and breastfeeding. • Refer to healthcare professionals when support requires clinical assessment, a need for prescription or medical diagnosis. Are you in need of birth doula services and want to learn more? Drop me a line. I'd love to hear from you! · Your body is growing, and so is your family. Self-care is essential to establishing healthy family habits that you can pass on to your kiddos. Taking time to connect with your body and to manage your stress is an act of love worthy of emulation! · Three words (maybe you’ve heard them before): optimal. fetal. positioning. When you stretch and tone your body, thereby bringing balance to muscular systems, your babe is more likely to position herself (or himself) head-down, bum-up, facing mom’s spine. This can make for an easier birth for both mom and baby. · A mindful-based yoga practice has been proven to decrease maternal depression and to promote overall wellbeing in both babies and mamas. · Finally, joining other mamas on their journey through pregnancy in a judgment-free space is a great way to cut out the chatter about what you should be doing as a mother, and to cultivate your own intuition and sense of empowerment. You got this! While this series is appropriate for yoga newcomers, I always recommend consulting with your healthcare provider before beginning a new exercise regimen during pregnancy. Even gentle yoga might not be appropriate for you, if you have a history of miscarriage or placental bleeding during pregnancy. The good news is that as more and more research is done about yoga and pregnancy, the results show that many yoga poses are even safer than previously thought. Of course, feel free to be in touch if you have any questions about the class or me. I look forward to seeing you on the mat. Until then, take gentle care of yourself and your growing babe. Are you pregnant on Nantucket? Register for my series here! I've washed ashore on Nantucket, Massachusetts! So much gratitude to Japan for hosting me and teaching me about birth and life and womanhood. There are a few more Japan posts coming soon to the blog, but my feet are firmly planted in a different place now. Looking forward to seeing what gifts (aside from stunning sunsets) this new island has to offer. Stay tuned! So, here you are. (Or here is your friend / sister / boyfriend's sister). In early labor. Giddy and nervous. Contractions are not too strong. You're texting everyone in a celebratory flurry. Find your love and look at their face. Find your partner, your kiddo, your puppy and take some deep slow breaths looking at them and holding them. Remember what and who makes you feel loved, safe, warm and supported. Do this whenever you feel lost during your labor. Snack. Drink. Move. Repeat. For as long as you can (before hospital rules or your own body get in the way), let this be your game plan. Don't forget to eat energy-packed food, take a drink after every contraction, and stay active. It helps. Amy wears a patient's baby at the clinic! 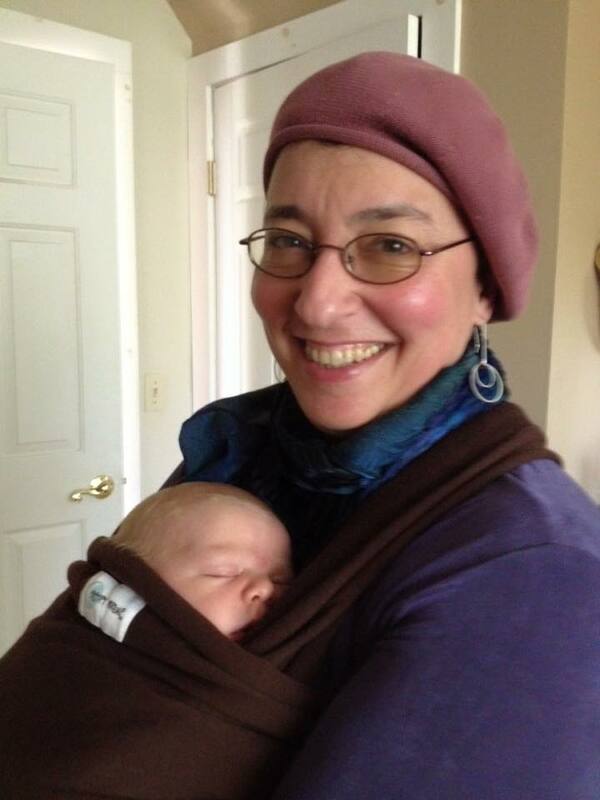 Amy Mager is a doula, acupuncturist and mother of six (!) based in Western Massachusetts. I am missing her treatments and amazing motherly advice while I'm here in Tokyo, but thankfully her wisdom travels everywhere. No matter what kind of birth you're planning and no matter what country you find yourself in, Amy's tips for birth preparation will help you. Yes, YOU! 1. Watch Funny Movies! Laughing opens and heals. This relaxes your jaw & your mouth which relaxes your pelvic muscles & the mouth of the cervix. Watch movies so funny they make you pee – relaxing is the goal and fun is a good thing. 2. Enjoy the prospect of breathing softness down and into your cervix. “Softening, ripening, opening” has always been my mantra from 37.5 weeks on. Say it to yourself 3 times. Right before you get up and as you get into bed. Your subconscious is more open to shift then. 3. Close your eyes. Breathe in through your nose & out through your mouth. Breathing in anything you need to nourish and nurture yourself. Breathing out, letting go of one thing you’re holding onto, one thought, one place that’s tight or holding so it can be absorbed and dissolved. Do this twice a day, 10 times. We are most affected as we're falling asleep and as we are waking up. And, if you're feeling stressed? Give yourself the gift of 3 breaths - any time. 4. Squat, squat squat. Flat footed squatting opens your pelvis, supports your babe to move down and apply pressure to your cervix. You can lean on a ball or at the foot of your bed. You can also do supported squats with your partner behind you, arms through your armpits. By yourself? Want something less intense? Bounce on a ball, slideback and forth over the ball. 5. Dance party at your house :). Turn on your favorite music and rock those hips! Your baby’s head is the heaviest part of your baby. Hip circles will help move your baby into helpful alignment for birth & apply pressure to your cervix. The most comfortable thing? Not always, AND it will support your cervix to soften, ripen and open. Helping your cervix be soft will help your contractions work effectively. When it's right for you, dancing intimately with your partner will help. Relaxing an opening are the name of the game and support the process. 6. Talk to your precious one. Engage and involve your baby in the process. Your baby understands everything but highly technical language. Ask your babe to move down and down. Putting pressure on your cervix, asking baby to help you open. This is a helpful thing to do while doing hip circles and squatting. WAIT. A. MINUTE. I hear you saying on the other end of the internet, didn't all your "snacking" make you a diabetic?! Who are you to be giving snack advice to the masses? Giving Birth Abroad? Oh, the Questions! Being pregnant in a foreign country is a particularly perplexing experience: so. many. questions! Every time I'm around international pregnant women, there is a flurry of information exchanged. Often, I find the questions more fascinating than the answers. They indicate so much about what is normal in the culture of the questioner, and I find myself reflecting on the normal birth narrative in the States as I make my way home from these meetings. Great new articles to bookmark if you're pregnant or interested in birth! I'll be offering prenatal yoga at Sun and Moon Yoga in Gotanda beginning on October 4th, 2015! This six week session is open to all pregnant women and others interested in prenatal care, regardless of past yoga experience. I recommend that you practice yoga after 14 weeks of pregnancy, unless you've had a regular practice prior to getting pregnant. Each week we'll focus on stretching, strengthening, and guided relaxation. Drop-ins and latecomers welcome! Sundays 4:30 - 6 p.m.
A mother-to-be, pregnant with her second baby, recently lamented to me about her not-so-healthy eating habits while she was nursing her first baby. I recently attended my first meeting of Tokyo Pregnancy Group, an amazing organization of English-speaking pregnant women, who are all preparing to give birth in Tokyo. Members at this meeting were from all over the world and my favorite part of the afternoon, by far, was hearing about their personal backgrounds and the different cultural myths and practices that they've brought with them here to Tokyo. This is not my first trip to Japan, but it is the first time that I'm here while in contact with expectant mothers. I often find myself discussing the challenges and benefits of raising kids in the world's biggest city.